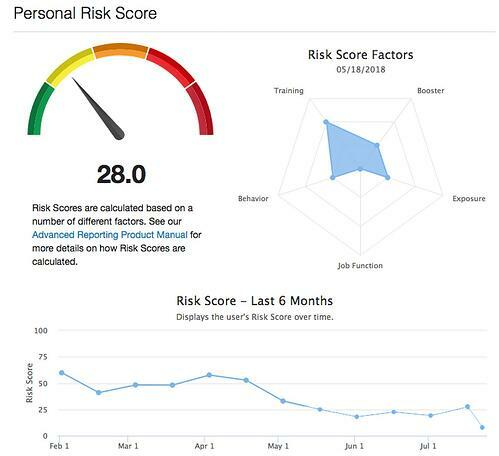 The new innovative Virtual Risk Officer (VRO) functionality helps you identify risk at the user, group and organizational level and enables you to make data-driven decisions when it comes to your security awareness plan. With VRO, you can monitor where your employees and organization stand over time when it comes to user risk. With VRO you’ll understand where improvements need to be made to improve the strength of your human firewall. VRO’s dynamic Risk Score enables you to take action and implement security awareness mitigation plans for high-risk user groups that are most vulnerable to a social engineering attack. The Risk Score for a user is calculated by several different factors, including how likely the user is to be targeted with a phishing or social engineering attack, how they will react to these types of events, and how severe the consequences would be if they fell for an attack. What users are the most vulnerable to a phishing attack? What groups haven’t had any training? What types of phishing templates are my users most prone to clicking? What are my highest-risk groups? The new Advanced Reporting feature gives you a collection of 60+ built-in reports with insights that provide a holistic view of your entire organization over time, and dramatically expands instant detailed reporting on a host of key awareness training indicators. Additionally, you'll see next-level reporting for phishing and training campaigns as well as a general overview of your last 6 months, and you can drill-down into one-time and recurring campaigns for more detail. You can also leverage Reporting APIs to obtain data and create your own customize reports, integrating with other business systems that present the data from your KnowBe4 Console. Executive and enterprise-level reporting gives better visibility into your entire organization’s security awareness performance with insights into correlated training and phishing simulation data over any specified period of time. This report shows your organization’s PPP for groups relative to the amount of time spent training. 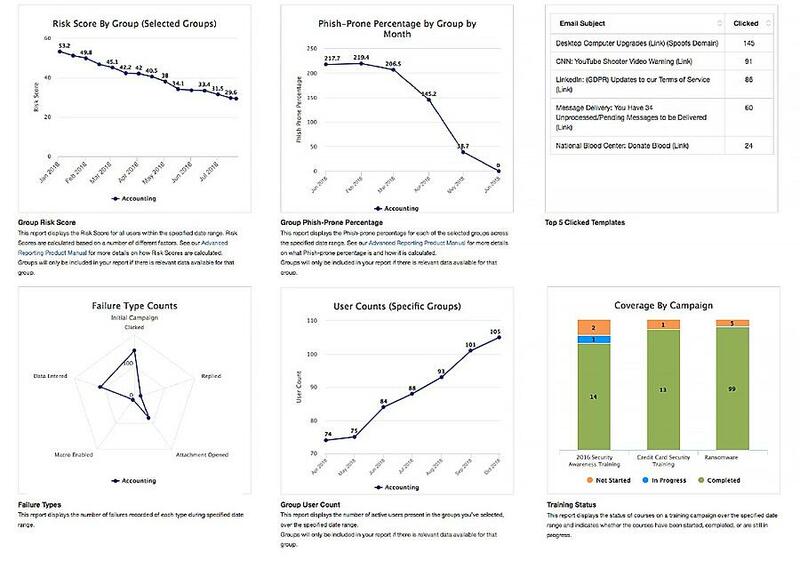 This report includes Risk Score, Phish-prone Percentage (PPP), Failure Types, Group Size, Top 5 failed templates and Training Status for the specified group over the past 6 months (or other time period). See these new features and more for yourself, request a product demonstration today!